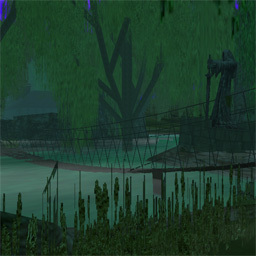 Terrax Swamp is a thick, swampy region that occupies the entire Avatar Mountain Gorge on SW Island. The dense canopy created by the Ortonian Willow trees, and it's location inside the gorge, create a night-like aura almost 24 hours of the day. This phenemonon has attracted a number of nocturnal creatures which now inhabit the area.